As many of you know, I got my dance start in the ballet. In my opinion, every dancer should, in order to form the grace and skills that I have not seen any other dance teach quite as well. I still miss the ballet, though I am happy where I am so me and the Sirens sought to create a new ballet experience. One that everyone could appreciate and would be a bit... different. Combine this with our love for Halloween and the Gothic Fire Ballet was born. 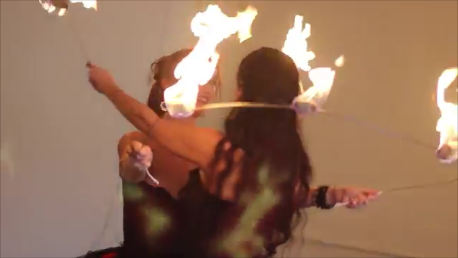 In our fire ballet we use our own custom fire props to tell the story of vengeful ghosts whose lives ended at their own hands due to their broken hearts. Now they dance to their mournful songs while plotting their revenge to their still alive suitors. Though some scary elements, it is a family friendly show. Performed en pointe (when floors allow) and deeply rooted in classical ballet.